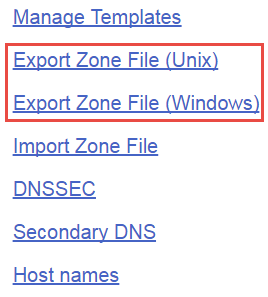 You can export your domain's zone file records to use with a third party or to archive. For example, if you want a third party to manage your DNS, you can export the zone file records from us, and then import them into the third-party system. Archiving your DNS records gives you a backup copy of them if you make a mistake while editing your DNS. The exported data follows the BIND zone file format and RFC 1035. You must manually edit the exported data before a BIND DNS server can use it directly. These edits will differ based on the requirements of the server to which you are uploading the exported file. The system generates a text file that contains the zone file records for your domain name. Save the file to your computer.